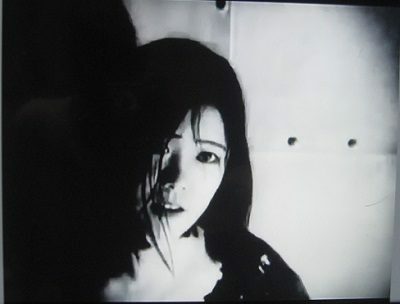 A Page of Madness is a visually stunning masterpiece. It peels back its inner mysteries in both beautiful and disturbing ways. Made without intertitles, it is from the opening moment’s enigmatic impressions and scenes, a moving cacophony of which we’re not quite sure how it all fits together. We see a beautiful dancer in an elaborate headpiece dancing on a stylized stage. As the camera backs away, suddenly we are seeing her through bars, like those of a prison. When the scene cuts to a girl in a ragged dress, dancing feverishly in her cell as if compelled by an unseen force, it becomes clear that she is an asylum inmate, and the beautiful woman we first saw is her delusion. Just like in Cabinet of Dr. Caligari, a film this is most often compared to, a plot eventually emerges. The old janitor works at the asylum to be near his wife, who is a patient there. When their daughter arrives with the news of her engagement, the family’s story, in the form of flashbacks, begins to piece together. The janitor attempts to free his wife from the asylum, but she seems unwilling to go—perhaps she knows it’s where she belongs, although there are signs that she may be afraid of her husband, who may be going mad himself. Often called an “experimental” film, it can be interpreted in many different ways. The director himself, in his autobiography, said he decided to make it after seeing “the entourage of a certain noble gentleman, “one whom “secret whisperings” identified as Yoshihito (later Emperor Taisho). This film could therefore be also construed as a political allegory. The best films are always open for debate and however you may wish to interpret this film, it’s up to you. 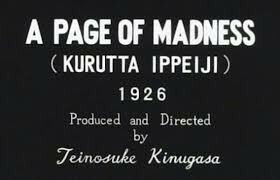 Director Kinugasa went on to become a pillar of mainstream Japanese cinema (even bringing home the Palme d’Or from Cannes in 1954. His bizarre early masterpiece was thought lost for decades until the director himself uncovered a print in his storehouse.